This was the first time I saw them live, and by my reckoning I was only 14 years old taking the District Line on my own across London to see them. They were one of several acts to perform at a really strange event which went on at this West London exhibition hall for two or three days. 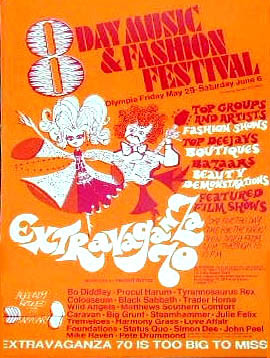 The overall event was called 'Poptastica' or something dumb like that ['Extravaganza 70', according to the poster], and, as I remember it, featured all manner of 'pop' acts of the time, most of who were naff second-rate minor chart acts, playing on a raised stage in the middle of what was basically a trade show, with lots of stalls selling music paraphernalia. I wandered around this poorly attended exhibition, until the bright lights dimmed, and a Smashy and Nicey-type DJ announced PH (it was the Brooker, Trower, Wilson, Copping line-up). I joined about fifty to a hundred other PH fans who self-consciously shuffled up to the stage. I remember they played well, especially considering the poor atmosphere of the event. I think it was a week or two after Home came out and they mostly played tracks from that album, (I remember Still There'll Be More, Whaling Stories, Whisky Train, About To Die and maybe one or two others) as well as some earlier numbers (A Salty Dog, Wish Me Well, The Devil Came From Kansas and Repent Walpurgis to end on). This was at a time when they were trying to get beyond A Whiter Shade Of Pale, and I didn't see them play it live for a long time - not until after Robin Trower left, I think. It is obviously a long time ago, and the details of which songs they played at which gigs is a bit blurred, but this was the basic format of all the earliest concerts I went to. I don't have any specific memory of an encore at this gig, but I recall they would always go into one or two Rock'n'Roll / R'n'B classics to try and get the audience on their feet at the end; a song I've never heard of since called Well I [on record here] and Little Richard's Lucille were the two they nearly always did. This would have been the second gig I saw them at, a few weeks after the Olympia gig. The theatre (all Victorian gilt and red velvet) was used as a discotheque at the time, and all of the seats of the auditorium had been taken out for this reason, even though the floor sloped down towards the stage. The decent-sized audience sat cross-legged or sprawled about on the floor, as was the norm in those days. As I say the set list was pretty much the same. Although I used to sit entranced, with my mouth agape at every gig I ever saw them at, I think this line-up of the band never really worked onstage, not over a whole gig anyway; the more upbeat and rocky numbers, where Chris Copping played bass and Robin Trower let rip on guitar, sat rather awkwardly with the organ-based numbers where RT looked bored at having to play bass, or when he was allowed to get his guitar back out, where CC played an odd bass-keyboard on top of his organ - he never was a great organist, and his solos were a bit lame, especially in these, his earliest days with the band. At least this was a more conducive venue for the music, especially on the moody and swirlier numbers like Repent Walpurgis and A Salty Dog, where BJ Wilson would really take the band to another level. The only detail I recall vividly from this gig (for some reason), is the fact that Gary Brooker's microphone was set up at an awkward angle and he complained to a roadie about it between songs; "This is doing my neck in". The support act for this gig was Supertramp - a long time before they got to be famous. Not The Pavilion, as I realized after arriving late and having to chase around for the proper venue in a panic. I needn't have bothered. The support acts, Terry Reid and Stone The Crows, turned up on stage very late and played long rambling sets. Reid and STC's Maggie Bell both had great voices, but, as this gig emphasised, never seemed to find the right material or backing musicians to do them justice. PH eventually turned up on stage and played fine - I don't really remember, to be honest, all I do recall is staying to the very end of their set, encores and all (how could I tear myself away? ), and arriving at the station long after the last train back to London had left - I spent an awful night trying to hitch home, eventually getting only as far as Gatwick airport as the sun rose, and got an early train home from there. They were support for Jethro Tull, and a decent Irish folk act called Tir Na Nog played first. I hadn't realized I would need a ticket - PH weren't that popular as a live act at that time, and I hadn't needed to book for their previous gigs. Luckily, I managed to blag my way in. This was a big gig for them; a big audience at a prestigious venue, and they played really well. RT played particularly well - all screaming guitar and tortured facial expressions - the odd acoustics of the venue sending the wailing and screeching noises echoing around the rafters. PH played a much better and tighter set than Jethro Tull - who most of the crowd had come to see; they were a bit sprawling and show-bizzy, playing long and boring individual solos and playing up to the crowd. I assume this was near to the release of Broken Barricades, but can't recall ever hearing RT playing any of that album's material live - does anyone else know? I sort of remember hearing them play Shine On Brightly (very well), at this gig, which I don't think I'd heard them play before. think that the fact MG was on guitar made a big difference - his style always suited PH's sound better than Dave Ball, although I have to say he never even got close to RT in terms of emotional intensity. Mind you he was a lot better at the subtle bits of fills and colours where he wasn't actually soloing - RT always seemed to be waiting for his next turn to step to the front of the stage to let rip. Yup, you guessed, I don't recall much of this gig, although I did stroll through Oxford on the way there - what a nice place. What I do recall is being dragged backstage by a friend after the gig and going around the cramped dressing room collecting the band's autographs on a leaflet for the gig. I'm sure I've still got it, but God knows where - I'll have a quick look in the back of my sock drawer. Queen Elizabeth Hall, London (two different gigs? ), 197? Sorry, but the old memory is very fuzzy at this point and my recollections of these concerts have become muddled together - I don't even remember if they played once or twice at the South Bank at this era. The only clue I recall to the dates of this / these gigs is that during the middle section of Grand Hotel, they went into a quick burst of Here Comes The Bride and projected a slide of the happy couple of the royal wedding that had taken place a day or two before - I believe it was Princess Anne + hubby, but royal weddings aren't exactly my strong point. At one of these gigs GB mumbled an announcement that they were about to play one of their old songs called Bank Villain, to a ripple of applause from the front rows, as I racked my brain for when they had recorded this undiscovered gem they broke into Magdalene and all became clear. I know I saw Dave Ball at least once so he must have played one of these gigs. The Fairfield Hall gig I recall as being particularly good especially BJW, who had shifted his kit over to the left of the stage, as was his wont in those days, and played out of his skin (and maybe out of his skin). MG had joined them by then, I remember him playing well on A Christmas Camel - the only time I heard them do it live. Oh, and I remember them doing Souvenir Of London with CC playing banjo and he also once did a crap dance at the front of stage as he played the tambourine from the instrumental bit in the middle of Simple Sister - that was about as lively and boisterous as PH ever got live in those days - GB used to be quite amusing with his between songs banter, but I don't think that anyone else in the band ever said or did anything but play their instruments. They had also started doing AWSoP as an encore by this period, not particularly from public pressure - I don't recall anyone ever yelling out for it at any of their gigs, but it was always greeted rapturously. Thanks Bruce ... further details about any of the above will be happily received! Mail us!